The Natural ends with contrived fireworks and a shower of sparks, a case of blatant celebratory self-congratulation that has the potential to cause nausea. But accepted on its terms as an unapologetic baseball fairytale, The Natural is a feel good movie that survives the gallons of sweet syrup dumped onto the screen. The screenplay unfolds like a child's bed-time story, but there is enough talent on display to touch the heart of more mature sensibilities. It's the 1920s. 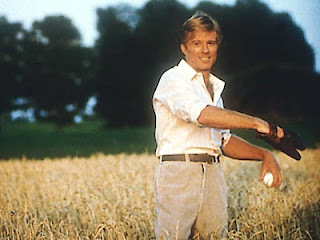 Young baseball pitcher Roy Hobbs (Robert Redford) appears to have superlative talent, and is called for a try-out by the Chicago Cubs. Leaving behind his sweetheart Iris (Glenn Close), Hobbs is seduced on his journey by Harriet Byrd (Barbara Hershey), an unstable woman who shoots and severely wounds him in her hotel room, apparently ending his professional career. Sixteen years later, now well into his thirties and having converted from pitching to hitting, Hobbs joins the struggling (and fictional) New York Knights after being spotted by a minor league scout. Hobbs struggles to convince coach Pop Fisher (Wilford Brimley) and his assistant Red (Richard Farnsworth) that he deserves his shot in the majors. When he is finally given the opportunity, his incredible hitting ability revitalizes the Knights, who go on a winning run. Journalist Max Mercy (Robert Duvall) starts snooping around to uncover Hobbs' past, while team owner The Judge (Robert Prosky) deploys the sultry Memo Paris (Kim Basinger) to distract Hobbs, as The Judge needs the Knights to lose in order for him to gain full control of the team. The script conjured up by Roger Towne and Phil Dusenberry cleans up the harder edges of Bernard Malamud's novel, and strips down the story to the simplest good versus evil narrative, with the King Arthur legend providing the base inspiration. 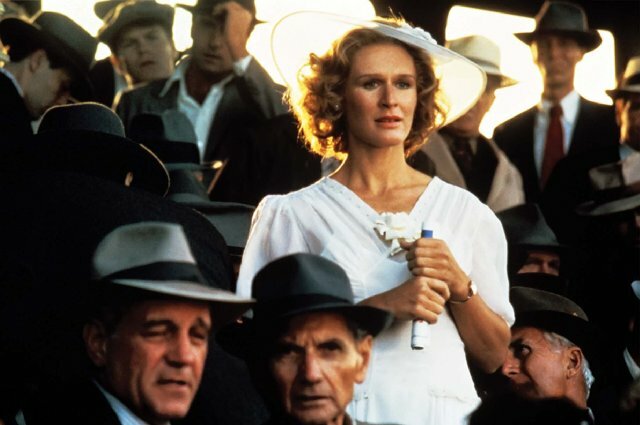 Director Barry Levinson plays along, bathing Glenn Close as the good Iris with white light straight from heaven, with only the singing angels and spiritual harps missing from her scenes. The evildoers, meanwhile, hatch their devious schemes from literally dark caves, Robert Prosky's The Judge refusing to even turn on the lights in his cavernous office, and Levinson just barely managing to resist adding prolonged maniacal laughter to his scenes. Fortunately, Robert Redford and Robert Duvall are around to add some adult-worthy entertainment. 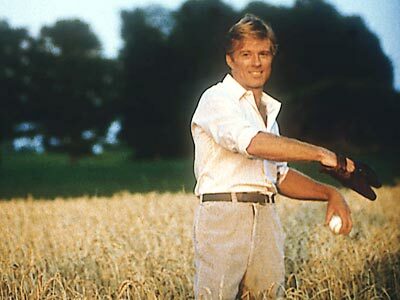 Redford's natural wholesomeness shines through, and at least he is susceptible to the dangerous charms of first Harriet and then Memo, otherwise Roy Hobbs would have been fully expected to walk on water. 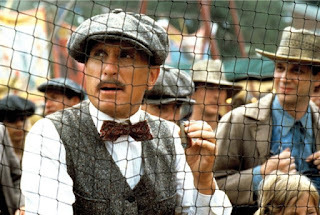 It is left to Duvall to bring forth the crustiness of the baseball observer, his Max Mercy able to look past Hobbs' heroics and search for the hidden story behind the hits, baseball being nothing if not a sport that values legacy. Also contributing to The Natural's charm are Wilford Brimley as coach Pop Fisher and Richard Farnsworth as his assistant Red, two baseball men well past their sell-by date and living out the closing days of an abandoned dream. Fisher is so busy lamenting lost opportunities that he needs Red's help to notice Roy Hobbs as the gift from the gods, dropping into his lap for a final drive at glory. For once three women get crucial roles in a sports movie. Hershey sinks her stinger into a short but unforgettable turn as black widow Harriet Byrd. Kim Basinger is adequate as the resident distraction deployed by The Judge to gain control of the team, while Glenn Close makes the most of the glow that Levinson bequeaths onto her, Iris unwittingly controlling Hobbs' destiny across the years. The Natural may have surrendered opportunities to deliver a darker, more thoughtful story. But it does achieve its admittedly less ambitious objective: pure mythological escapism centred on the baseball diamond.